A fruity spin on a classic, the Cushman's™ HoneyBell Cheesecake is a delicious and creamy dessert for anyone who enjoys sweet citrus desserts. 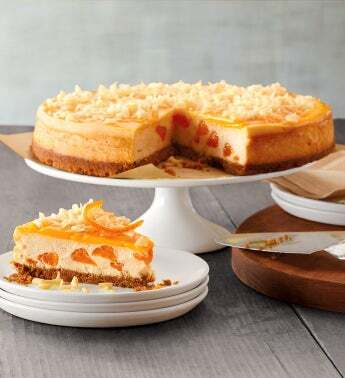 Made according to a traditional New York-style recipe, this citrus cheesecake is filled with pieces of juicy mandarin oranges and baked in a graham cracker crust. As a final touch, the cake is topped with a layer of sweet HoneyBell-flavored glaze and finished with elegant white chocolate curls.